Hello and a BIG Welcome to my blog! My name is Winse and I am a Food Writer and the author of these delicious home favourite recipes. Winse`s Wee Wok is a blog about authentic Chinese recipes. All inherited from my mother and grandma which in turn were from many generations before them. 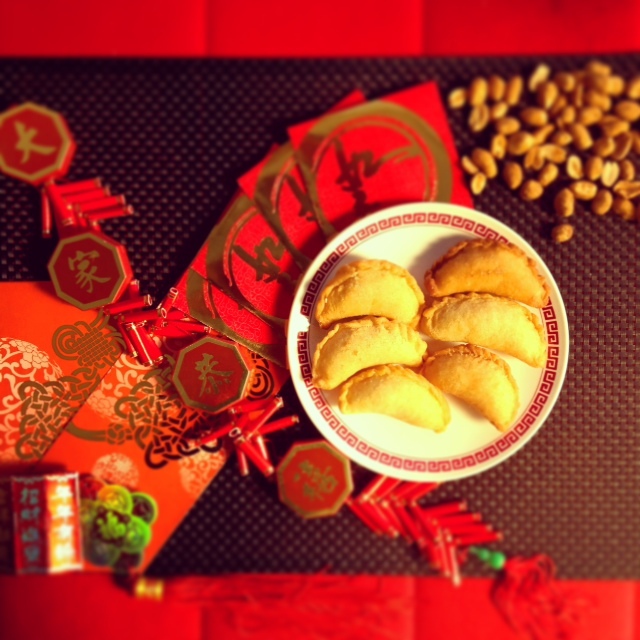 In Hong Kong almost every household will have these tasty dumpling puffs for Chinese New Year. These golden coloured deep fried puffs are completely addictive. The Chinese loves these because they provide that crunch from the peanuts, sweetness from the sugar and that oh so crispy pastry. Lastly their colour and shape which to some thinks it is similar to gold ingot or Sycee which were the 20th Century gold money used in China. Well, in food terms! I think they will look more like an ingot if it was wrapped in edible gold paper but that is too excessive and someone will give me a slap in the head! 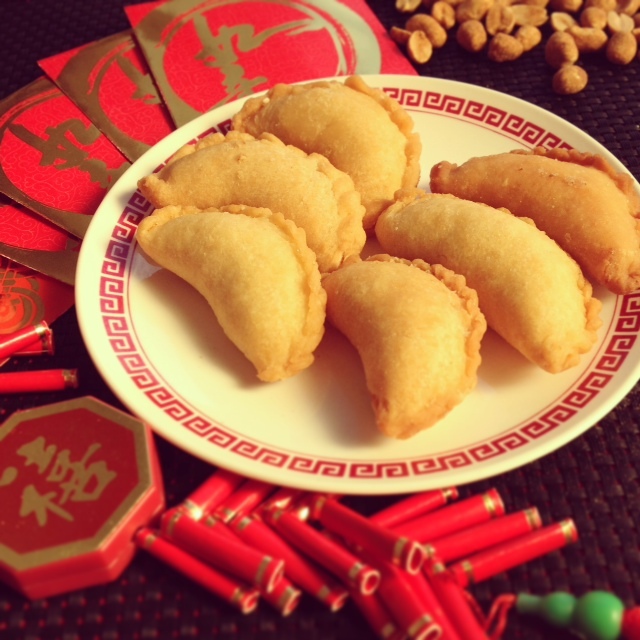 Note:- Make sure the edges are completely sealed and the outer dumpling puffs are free of any peanuts or sugar. This prevents the oil to be burned from any leaking sugars. • Sieve the flour into a mixing bowl, combine all the dough ingredients. Mix well and kneed to form a smooth/soft dough. • In a pan, slightly toast the sesame seeds on a low heat until they turn golden brown. This should only take a minute. Add into a separate bowl. • Crush the peanuts using a mortar/pestle, coffee grinder, blender or your rolling pin. Place into the bowl with the sesame seeds. Follow by castor sugar. Mix well. • Flour the working surface, roll the dough into a thin sheet. Cut the sheets with a cutter mould. Add 1 teaspoon of fillings into the centre. Fold in half, press the rims of the dumplings, pinch to seal the edges and tuck the edges inwards to form a pattern. • Heat a wok on medium heat, add a litre of oil. Once the oil is smoking hot, deep fry 15 puffs at a time for 5 minutes until golden brown. Drain and allow to cool before you store them in an air tight container. Enjoy!